Time sure flies by! It was just a week ago that I planted these little tomato seeds in the Burpee Seed Starting Kit. They are really doing well. By 7 days they were definitely emerging and doing well. 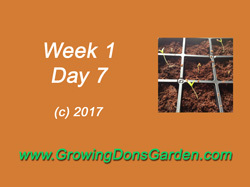 It is a lot of fun for me watching these tomato seeds grow and emerge into seedlings. There are only a couple of plants that have not emerged, but if all of these make it, I'm going to have more plants than I will know what to do with. I'll need more Earthboxes! Most likely though, I will give them away or swap them or something. They will not go to waste. This is the first day that I have added any water to the Burpee Seed Starting Kit. I put in one water bottle of water from the faucet. I'm still not sure how I'm supposed to water these as they grow. That looks like it could be a challenge, but time will tell. I am keeping the lid off the grow tray because of the mold/fungus that was showing up. These seedlings are going strong enough now, I don't think they would need much protection indoors. Let's just hope the cats don't get curious! So here's a short little video giving you a much better view of what is going on than just what I can show in a picture. So check it out on YouTube! As always, keep checking back each day. I'm trying to detail the progress of what is happening. Getting things ready outside as well, so when it is time to plant, I will be good to go!